by Damien Lewis | Biographies & Memoirs | This book has not been rated. Bought for winner of Tea Books and Chocolate sweepstake! "In 1939, in the cold snow of no-man's-land, two loners met and began an extraordinary journey together, one that would bind them for the rest of their lives. 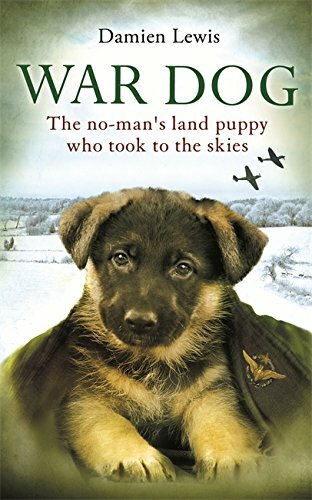 One was an orphaned puppy, the other a Czech airman shot down over France but bound for Britain and the RAF. Airman Robert Bozdech hid the tiny German Shepard, whom he named Ant, in his flying jacket as he made his escape, and from that moment on the pair were inseparable, saving each other's life countless times as they flew together with Bomber Command. Wounded in action, facing crash-landings and bailouts, Ant was eventually grounded due to injury. But he refused to abandon his duty as squadron mascot, risking his life to wait beside the runway for his master's return from every sortie. By the end of the war, Robert and Ant had become very British war heroes, and Ant was justly awarded the Dickin Medal, the 'Animal VC'. Thrilling and deeply moving, their story will touch the heart of anyone who understands the bond that exists between one man and his dog." It's set during WW2, so it's obviously a bit tragic in terms of injuries and friends that dies. But it's also a lovely story about a strong friendship between a man and a dog. Found at the postcrossing meetup in Tofte Sunday, July15, 2018 in the house where we stayd, Bikuben Hotel.